As nostalgia rushes over many of us (who were technically born far far too late for the feeling to even be considered nostalgia) we can consider another of the 70s biggest achievements: the introduction of LGBT Pride, a now-annual event that is celebrated and delivered with aplomb by the LGBT community and beyond, in a glorious multitude of countries around the world. 1969 (to be absolutely exact) became a turning point in LGBT history, originating from quite an unlikely source – a mafia-owned gay bar in Greenwich Village, New York City. On Saturday 28 June, a police raid on the popular Stonewall Inn led to riots from the LGBT community for a number of weeks and spurred the community into action, protesting for their rights to be open about their sexuality without fear of persecution. It is considered by many to be the most important modern event in the struggle for LGBT rights. Unwilling to allow the brutality and forced marginalisation that the police had brought upon the LGBT community to be forgotten, LGBT Americans came together as a cohesive community, and 1970 saw the first Pride march take place in Chicago, traversing the streets from Washington Square Park to the Water Tower. A larger march took place the following day in Central Park, and other US cities quickly followed suit. This was a movement that whole swathes of communities could get on board with – it was fun but conveyed a darker message at the same time, that for too long LGBT rights had been excluded from the growing push for civil rights and that people weren’t to stand for it any longer. 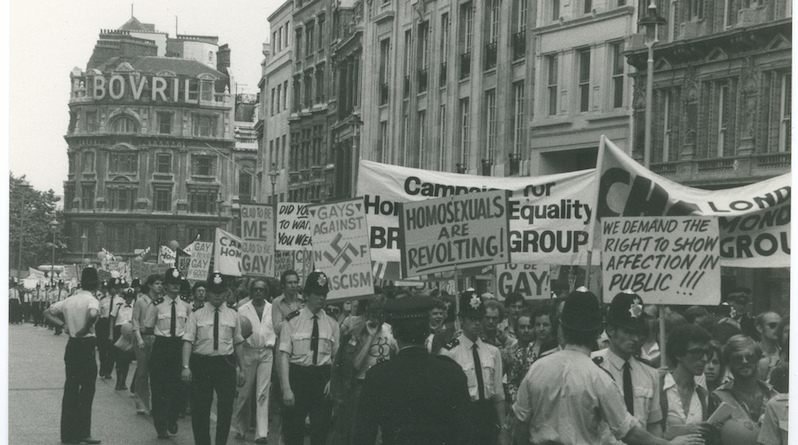 The 1980s and 1990s saw a slow de-radicalisation of LGBT Pride events, with words like ‘liberation’ often dropped from the titles of the marches, but the popularity of the marches continued to grow. In 2000 President Clinton called the first ‘Pride Month’, of which there have been a number since. While none such blatantly-prejudiced legislation exists today, there are now almost 100 Pride events across Britain, upholding the memory of Stonewall and bringing hundreds of thousands together against divisiveness and in the spirit of love and unity. This year’s London Pride takes place on 8 July, kicking off around midday in Trafalgar Square. The Fumble team will of course be donning our finest rainbow attire and heading down; we hope you will too!